I chose a different approach this year when I found an openly reluctant reader. Normally, I would try to get to know the student, figure out their interests, ask for suggestions from the librarian or do some online research about popular books. This year, instead of approaching my goal of changing Johnny’s mind about reading alone, I’ve included the entire class in the process. Establishing a strong classroom community is essential for academic, social, and behavioral success. By enlisting my class in the goal to change Johnny’s mind, we’ve become stronger as a group. Last week I mentioned that other students were now recommending books for him. While this sense of community and caring for others is exactly what I want in my classroom, I also want to be sure that the students, including Johnny, understand the importance of making that shift from being a reluctant reader to being an avid reader or at least having an open mind and a willingness to try. Noticing the way the students laugh when Johnny makes comments about not reading, I also want to be sure that this journey doesn’t become a form of amusement. One other concern I’m beginning to have is that the other students, particularly the other less than enthusiastic readers, may use this as an opportunity to blend into the background. If I’m focused on showing the class that Johnny’s mind can be changed, then I might not make a big deal, or even notice, that others are practicing avoidance. So far, I’m hoping this isn’t the case. Any teacher knows that all students are different and thus, require a different approach. So while it may be entertaining, powerful, and even successful to allow Johnny’s reading journey to be public, I am quietly aware of the other journeys taking place. I wonder if these students notice the subtle push I hope that I am giving when I offer or suggest books in the library or the classroom. 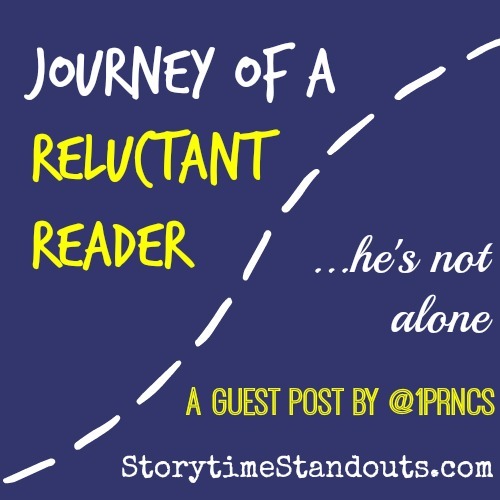 Does the classroom awareness of our reluctant reader’s journey make these others want to read more or less or have any impact at all? Are there ingredients I’m missing to help push the others forward in their own journeys? Is knowing their reading level and interests enough? What about those students who want to read more but struggle? I’m still working on answers to some of these questions. What I do hope, is that those students who aren’t having their journeys made public, recognize that I’m aware of their academic needs as well. I’m hoping that the students are getting the right message from my decision to talk more publicly about Johnny’s journey. That message is that every journey is different and my goal as a teacher is to help each student find the tools and confidence to make their own journey successful and hopefully, enjoyable.